DAMASCUS, (SANA) – His Excellency President Bashar Al-Assad addressed the armed forces in a speech published in the People's Army magazine on Sunday on occasion of the 66th anniversary of forming the Syrian Arab Army. DAMASCUS, (SANA)_ President Bashar Al-Assad reiterated here Monday that Syria's option is to look forward into the future and to control the events rather than to be led by them. In a speech to the citizens at Damascus University Auditorium, President Al-Assad said "Credibility has formed the basis of the relation between the People and me, the credibility which has been built on deeds and not words, on substance and not on form,'' describing today's meeting as coming in a decisive moment in the history of Syria as to separate a yesterday, burdened with confusion, pain, and innocent blood, and tomorrow filled with hope. "Our only option is looking towards the future… we possess this option when we decide to make the future rather than have events make it… when we control it rather than it controls us… we lead rather than it leads us," President Al-Assad said, noting that this requires building upon a rich experience that showed shortcomings and a deep analysis. President Al-Assad asserted that Syria, throughout all of its history has been facing conspiracies against it for several reasons, some of which are linked to Syria's important geographic and political status and others are linked to its political stances committed to its principles and interests. ''What is going on in the street has three components the first one people who have needs and they want the state to fulfill them, the second component is represented through the outlaws and the wanted due to different criminal cases and they found that state institutions are a target for them because these institutions stand in the face of their interests and because they were dismissed from them so chaos for them a golden chance that they should seize to remain free and boost their illegal acts,'' added President Al-Assad. "We do not find today that the Takfiri ideology is different from that we saw in the past decades but what has changed is the tools, methods and faces…this sort of ideology lies in the dark corners and it immediately appears once it has an opportunity and once it finds a mask. It kills in the name of religion, it sabotages in the name of reform and it spreads chaos in the name of freedom and that is why the escalation and chaos were the correspondent to every reform step announced or achieved and when justifications were lost, the use of weapons was the only choice for them to carry out the scheme,'' Al-Assad pointed out. "What we need to think about is more important than analysis regarding the conspiracy, because I don't believe that information will show all details soon, possibly not even in years, but some say that there is no conspiracy and this discourse is not subjective, not in regards to the crisis but rather in terms of the circumstances, history and the historic context of Syria," President Al-Assad said, pointing out to the blatant foreign political stances in their pressure against Syria and the attempts to interfere in internal affairs not for the sake of the Syrian citizens, but rather to reach a goal that is already know. "What do we say about these political stances? What do we say about the media pressure and the advanced phones that we're finding in Syria in the hands of saboteurs? What do we say about the falsification that we all witnessed?" President Al-Assad added. President Al-Assad pointed out that met several delegations, some of them representing protestors while others hailed from all regions and spectrums, stressing that distinction must be made between these people and the saboteurs. He said that saboteurs are a small but effective group that attempted to exploit others and took advantage of the good majority of the Syrian people to achieve several goals, stressing the importance of distinguishing between the two groups, noting that the first group is national and all the demands they relayed to him gave the homeland's interest priority, saying "they want participation, not to be marginalized, and justice." President Al-Assad pointed out that the recent pardon was the most comprehensive one for 23 years, with the last similar pardon being in 1988, and that despite that there is desire for pardon to be more comprehensive, adding that pardon doesn't take names into consideration but rather standards, pardoning everyone except crimes related to drugs, terrorism, armed insurgence and moral issues and similar crimes. "Despite that, and based on what I heard from a number of people and what I learned from other people I didn't meet, I will ask the Ministry of Justice to study the margin in which we can expand the pardon even if it needs another decree that covers others without threatening the interest and security of the state on one side, and at the same time without harming the interests of citizens regarding personal rights of citizens," President Al-Assad said. The President pointed out that seeking to enforce law doesn't exempt us from seeking social solutions that would deter people from making wrong decisions by motivating them to be good citizens that are integrated in society. "The question may be the number of these people… personally, I was surprised by this number as I had beloved it to be a few thousands before… at the beginning of the crisis, the number was over 64,000… imagine this number of wanted people for various cases whose sentences range from a few months in prison to execution, and they are loose," President Al-Assad said, noting that the current number is now a little less than 63,000 as some of them turned themselves in "64,000, more or less, equals in military terms five military divisions, which is almost an entire army… if a few thousands of these wanted to bear arms and commit acts of vandalism, you can imagine the amount of damage they can do to the state," the President added. "There are other components… I didn't discuss the external component and its role in the crisis and I didn't discuss the components we all know… there are people being paid to record and deal with the media… others are paid to participate in protests for minutes and be recorded… these components don't concern us much," President Al-Assad said, noting that by following the events, escalation and chaos were the answer to each reform step that was announced or achieved, and when they had no more excuses they resorted to the use of weapons to carry out their plot, sometimes using peaceful protest as cover for armed groups, and sometimes staging attacks and assassination. "Schools and shops and public roads were closed by force of arms… public property was vandalized, looted and burned… cities were cut off from each other by cutting off main roads connecting them, and all this represents a direct threat to the daily lives of citizens, their security, education, economy, and their communication with their families," he added. President Al-Assad said "When they failed in the first stage when they attempted to exploit the people with demands, they moved to a new form of action that they began in Jisr al-Shughour when they committed the atrocious massacres was saw through the media… they murdered security personnel… destroyed post offices that belong to the people and the city they live in… there is great malice… the point is they had advanced weapons that weren't available before and advanced communications equipment." "They tried to commit another massacre in Maaret al-Nuuman against a security detachment and almost succeeded if not for the intervention of the townspeople who protected the detachment in their homes… some of them paid the price when they were tortured and beaten and had their bones broken… I salute those who made this patriotic stance and I wish to meet them soon," President Al-Assad added. President Al-Assad added what is happening now by some bodies have no connection with reform and development… what is going on is a mere sabotage and as there is more vandalism as we move away from our developmental targets and aspirations,'' asserting that "We should mend what was damaged and we should rehabilitate the saboteurs or isolate them, then we can continue the development. ''The urgent demands of people have been implemented before the beginning of the dialogue…we lifted Emergency Law and abolished State Security Court; we issued an organizing law for the right to peaceful demonstration. A committee was formed to set the draft bill for the new election law as another committee was formed to set legislations and the necessary mechanisms to combat corruption,'' said President Al-Assad. ''We started a big workshop to modernize and update media and to broaden its freedom space and boost its responsibility as we also worked on setting a draft bill for a new local administration law in addition to giving the Syrian nationality to the Kurds who are registered in the foreign records and forming a committee for studying a new party law,'' added President Al-Assad. ''Equality, justice, transparency and honesty are the future headlines which we aspire for our country. We will have a new parliament in August,'' underscored President Al-Assad. The President emphasized that through the national dialogue any subject will be raised and the upcoming stage is the stage of turning Syria into a construction working team to compensate damages, bridge the rifts and heal the wounds. His Excellency President Al-Assad stressed we will prosecute all those who are responsible for the bloodshed or sought to do that, emphasizing that everyone was damaged and the accountability for that is the state's right as much as it is the right of individuals. "We want to search for an economic model which suites Syria and achieves social justice," President Al-Assad said. President Al-Assad said the application of the law does not mean to take revenge on those who broke the law, without killing or destruction, stressing that the State is like the father and the mother and embraces all based on tolerance and love, not on hatred and vengeance'' asserting that pardoning mistaken people doesn't mean giving up using force when it comes to damage of public interest. His Excellency explained that the intensive meetings with the popular delegations' allowed him to expand direct communication channels with citizens, saying that he will do his best for such meeting to be continued in the upcoming stage. President Al-Assad made it clear that achieving reforms and development is not an internal need only, but it is a vital necessity for confronting these schemes; therefore we have no choice but to succeed in the internal project as to succeed in our external one. "I call upon every person of family who left their city to return back as soon as possible. There are those who claim that the State would take revenge, which is untrue hence the Army is there at their service,'' added His Excellency President Al-Assad. 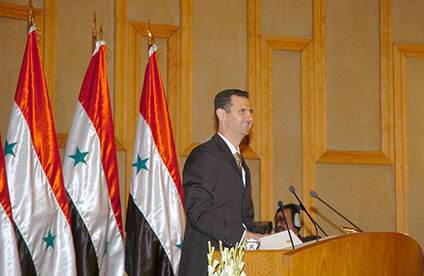 Damascus, (SANA)- Before President Bashar Al-Assad, the new government led by Adel Safar was sworn in on Saturday. Afterwards, President Al-Assad chaired a meeting of the new government and delivered a speech addressing directives to the ministers. In the beginning, I would like to welcome you to your important positions of responsibility. I would like particularly to welcome the new ministers who joined this government. I wanted us to start as soon as possible after forming the government; for every day that passes, we can achieve great things. My past week was full of activities. I met a number of delegations from different Syrian governorates; and there will be other delegations from other governorates in the next few days. I wanted to listen to all these delegations at this particular time, and to ask them for their views on the issues which they think should be priorities for this government and for the state in general. For the Syrian citizens, the new government means new blood; and new blood means new and great expectations. But for this blood not to become old in a short period of time, we need to renew it constantly. This renewal happens by introducing new ideas. This new blood is not necessarily related to the individuals who join the government, but rather related to the new ideas which we produce every day. The world is moving fast around us, and we need to move at the same pace so that we can say that we are developing. Otherwise, we will be moving backwards. The world is moving ahead every month, every week, and sometimes every day. What’s important at this stage is for us to reach a state of unity, unity between the government, state institutions and the people. We are supposed to be moving in parallel when we move in the same direction. In this case we maximize the outcome and the achievement. The more we distance ourselves from the Syrian population, the weaker our strength and the less our achievement. The most dangerous thing is the existence of contradiction between the direction we are moving in and the direction the people are moving in. The outcome in that case will be zero; and the achievement will be moving backward. The important thing, as I said, is to stress these channels of communication because the lack of communication with the citizens creates a feeling of frustration and a feeling of anger, particularly when there are daily needs and within the capacity of the state and yet we do not provide them. In that case the results will not be good. Of course, we want to open a broad dialogue with everyone; for everyone we meet should have a certain idea or a certain complaint. We need to talk to trade unions and organizations which represent professionals and interests throughout the country. We need to consult them, to build a dialogue with them, so that this dialogue and this consultation becomes part of the decision that we take and which has a bearing on the different sections of society which belong to these unions or these organizations. The challenges before us and before this government are as huge as the expectations pinned by the Syrian population on this government. They are as big as the challenges which lay ahead of us, the challenges we faced in the past and the ones we face at present. No government can make any achievement under any circumstances unless it in enjoyed popular support. From my meetings with sections of the population last week, I found that there is a gap which started to appear between state institutions and the Syrian citizens. This gap must be closed; and we need to find channels between ourselves and the Syrian population. These channels should work both ways. We need to broaden and strengthen these channels. And we need to fill this gap; but it should be filled with one thing which is trust, the trust of the citizens in the institutions of the state. This trust cannot be built except through full transparency with the citizens. This transparency and this trust will be able to provide sufficient popular support to your government, to enable it to carry out its tasks, even if we were unable to achieve a number of things. When we are transparent with our population, and we tell them that these are our capabilities, and these are the needs and the challenges, I am sure that the Syrian citizen has enough understanding. But when we do not explain to our population what is happening, and the details of the situation, how can we ask them to understand these circumstances if they don’t know them? His Excellency President Bashar Al-Assad delivered a speech at the People's Assembly on Wednesday addressing the Syrian people. "I am addressing you at an extraordinary moment during which the events and developments seem more like a test of our unity and zeal, a test which is, according to the circumstances, being repeated every now and then due to related conspiracies against this country, and we, by our will, solidarity and the will of God, magnificently succeed in passing the test every time and come out stronger and more impervious," said the President. He stressed that the people of Syria have always had their heads held high, adding "I speak to you from the heart in which the emotions of pride and belonging to this people and my emotions of gratitude of your love and appreciation are mixed with the feelings of sadness and sorrow over the recent events and the victims of our sons and daughters." "My responsibility is to remain vigilant in preserving the security of our Homeland and securing its stability," President Al-Assad noted. "I know very well that the Syrian people have been waiting for this speech since last week, and I have been late in delivering it on purpose until I have a full picture in my mind, or at least some of the main and primary headlines of this picture so that this speech will be far from emotional diction which comforts people but does not bring a change, particularly at the time when our enemies who are working in a regular, well-organized and methodological way to target Syria's stability,'' added His Excellency President Al-Assad. "We admit they (the enemies) have been clever in choosing well-advanced techniques to do what they have done, but at the same time we acknowledge that they have been so stupid with their wrong choice of the country and the people where such conspiracies never succeed," President Al-Assad said. "We say to them 'you don't have any choice except to continue in learning from your failure'. The Syrian people however have only one choice which is to continue in learning from their successes," the President added.